Admittedly, I made this recipe quite a few weeks ago. I took a little break from the ol’ blog to travel to a place that I am now very much in love with, Italy. More on the magical city of Rome and a beautiful island called Ponza in a post to follow. Before heading over to Europe, I received my next CSA box from Lancaster and amongst a box of beautiful greens and veggies all familiar to me, were a bunch of garlic scapes. I love this CSA for the new plants that it consistently introduces me to. Garlic scapes are first and foremost fun and gorgeous to look at. Their spiral nature- almost like pig tails- makes you want to just sauté or grill them whole and serve on a simple plate for aesthetic purposes. So, after admiring these green beauties for a while, I finally found myself wondering how they differed from regular garlic in flavor. I discovered that garlic scapes are the flower stalks of hardneck garlic plants. They appear a month or so after the first leaves, and are usually cut off of the plant, as leaving them on takes away strength from the growing garlic bulb. The flavor of the scapes is much milder and delicate than that of the bulbs. After getting sucked into the interwebs for about an hour searching for unique recipes, I discovered that most people use garlic scapes to make pesto. I gave in and decided that I would see what all of the fuss was about. As usual, I wanted to put my own twist on it so I decided to add some of the hazelnuts that I had in the kitchen. They are my snack of choice these days and I tend to always have some around. I kept the rest of the recipe simple and added some lemon and parmesan. I had also received some beautiful potatoes from the CSA so I blended up the pesto and tossed them on top of some potatoes for a refreshing potato salad dinner. There was a really nice balance of savory, tang and creaminess to the dish. I certainly enjoyed the pesto, but next time I may have to stick to my guns and just sauté these flavorful green spirals and toss them on top of something, or enjoy alone, simply to admire their natural born spirally charm. Cut potatoes into small pieces. Place the potatoes and 1 tbs of salt in a large pot of water. Bring the water to a boil, then lower the heat and simmer for 10 to 15 minutes, until the potatoes are barely tender when pierced with a knife. Drain the potatoes in a colander, then place the colander with the potatoes over the empty pot and cover with a clean, dry kitchen towel. Allow the potatoes to steam for 15 to 20 minutes. Blend all other ingredients together in a food processor. 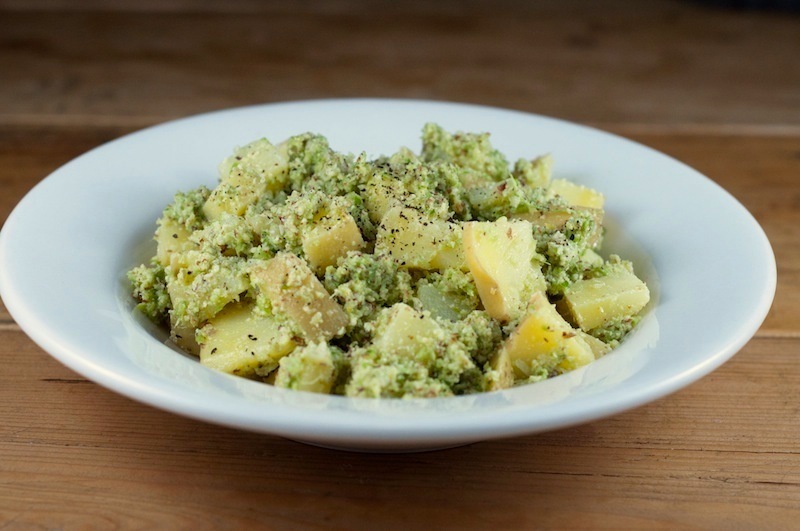 Once potatoes have cooled, mix in pesto and serve. This entry was posted in Recipes and tagged garlic scapes, hazelnuts, lemon, Parmesan, potatoes. This recipe looks delicious! I love the idea of a hazelnut pesto. Very jealous of your Italy trip! So glad you enjoyed it!